Is Gold’s Gym VX5000 Treadmill Worth Its Price? 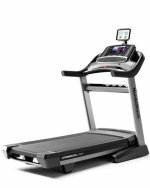 The Gold’s Gym VX5000 treadmill is a nice entry level treadmill that we were prepared to recommend as a very good buy for walkers or those interested in light jogging until the price went up by several hundred dollars. Unfortunately, it was a good buy at the old price, but not at the current one. UPDATE: The VX5000 has been discontinued. You can take a look at all of the most popular models for sale here to compare specs and prices of current Gold's Gym treadmills. Fitness experts give the Gold’s Gym VX5000 treadmill high marks as an entry level machine when it was introduced. They felt that the motor was more suited to walkers and light joggers, but they liked the variety of programs and 12 mph potential. One reservation they had was the rollers, which weren’t of great quality but for a price tag of $900 they weren’t quibbling. Now that the cost has jumped to a steeper $1,300 they shy away from recommending the VX5000. Those who own the Gold’s Gym VX5000 model are pleased with it in general, but a few reviews by consumers noted that minor problems with the electronics can arise. Normally this wouldn’t be a big issue, but with only a one year warranty on the treadmill parts and electronics, it can be a snag. We are disappointed that ICON got greedy with the VX5000. This Gold’s Gym treadmill was very good overall at its earlier price. You got lots of features for less than $1,000 and the twelve year warranty on the motor was pretty good. In fact, the 19” x 60” tread belt downright impressed us – even the tallest joggers can feel comfortable on this treadmill. But when the price on the VX5000 was jacked up by four hundred dollars overnight, we couldn’t overlook things that we had at the lower price. The smaller, cheaply made rollers and the thin deck coating just won’t hold up like they should in a machine that costs this much. In fact, there have been no improvements that justify this price increase. 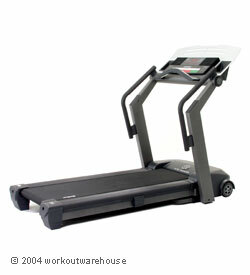 Bypass the Gold’s Gym VX5000 treadmill and look at something else in the $1,300 price range if you have the money.